This month, in its lame duck session, the Michigan Legislature intends to pass a number of bills harming public health and welfare and the environment – all without meaningful public input or debate. Included within this eleventh-hour debacle is Senate Bill 1211, sponsored by outgoing Senator Tom Casperson, chair of the Senate Natural Resources Committee. SB 1211 dramatically weakens Parts 301 and 303 of the Michigan Natural Resources and Environmental Protection Act, known respectively, when first enacted, as the Michigan Inland Lakes and Stream Act and Wetlands Protection Act. The Casperson bill constricts the definitions of “inland lakes” and “wetlands,” significantly reducing both regulatory oversight and the protection afforded these critically important resources. SB 1211 doubles the minimum size of protected wetlands from five to 10 acres and cripples future enforcement of violations of the act by imposing a new requirement on the Michigan Department of Environmental Quality (MDEQ) to not only prove that a violation occurred when a wetland is harmed or destroyed, but also show that the violator was legally negligent. The 6.5 million acres of Michigan wetlands that remain are the nurseries for our Great Lakes and freshwater inland lakes; they are fecund biological niches where synergies among biota provide food and habitat for countless insects, fish, reptiles, birds, and mammals. Limnologists regard wetlands as “biological super systems” and compare them to rain forests because of the complexity and variety of organisms and plant life they harbor. These ecological services protect communities and private property, imparting value and preventing loss – all free of charge. It has been estimated by the United Nations Ecological, Scientific and Cultural Organization (UNESCO) Ramsar Convention on Wetlands that wetlands provide trillions of dollars in annual health and ecological benefits worldwide. Beyond that, recent studies have revealed that wetland soils are a huge carbon sink, absorbing and sequestering carbon dioxide from the atmosphere in quantities 20 – 80 times greater than agricultural soils. Maintaining the vitality of wetlands will become a central strategy in combating climate change. Yet all of these benefits are either unknown to or callously dismissed by Senator Casperson and the Michigan legislature. 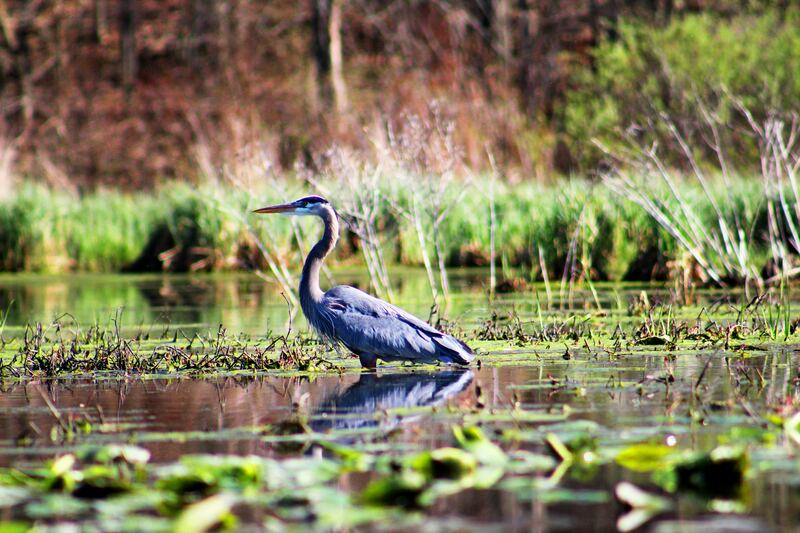 (a) Wetland conservation is a matter of state concern since a wetland of 1 county may be affected by acts on a river, lake, stream, or wetland of other counties. (i) Flood and storm control by the hydrologic absorption and storage capacity of the wetland. (ii) Wildlife habitat by providing breeding, nesting, and feeding grounds and cover for many forms of wildlife, waterfowl, including migratory waterfowl, and rare, threatened, or endangered wildlife species. (iii) Protection of subsurface water resources and provision of valuable watersheds and recharging ground water supplies. (iv) Pollution treatment by serving as a biological and chemical oxidation basin. (v) Erosion control by serving as a sedimentation area and filtering basin, absorbing silt and organic matter. (vi) Sources of nutrients in water food cycles and nursery grounds and sanctuaries for fish. (c) Wetlands are valuable as an agricultural resource for the production of food and fiber, including certain crops which may only be grown on sites developed from wetland. (d) That the extraction and processing of nonfuel minerals may necessitate the use of wetland, if it is determined pursuant to section 30311 that the proposed activity is dependent upon being located in the wetland and that a prudent and feasible alternative does not exist. (2) In the administration of this part, the department shall consider the criteria provided in subsection (1). Strengthening wetland protection should be an economic and environmental imperative. Every day, science brings new evidence that future generations are at risk, and that our future prosperity and fate are inextricably tied to our stewardship of the planet. All of this appears to be lost on Senator Casperson. Let’s hope that Governor Snyder has the foresight to wield the veto pen should SB 1211 land on his desk. To contact Governor Snyder, click here.